In E. coli, the rrn operon is transcribed into a 30S precursor RNA, containing 3 rRNAs and 2 tRNAs. The segment containing 16S rRNA (small ribosomal subunit) and the one containing 23S rRNA (large ribosomal subunit) are flanked by inverted repeats that form stem structure in the RNA. The stems are cleaved by RNase III. There is no apparent single sequence at which RNase III cleaves ‑ perhaps it recognizes a particular stem structure. 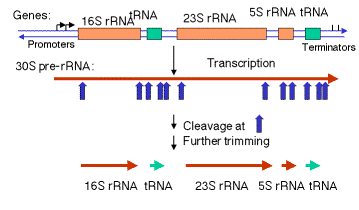 This plus subsequent cleavage events (by an activity called M16) generates the mature 16S and 23S rRNAs. The rRNAs are also methylated. The initial precursor is 47S and contains ETS1, 18S rRNA, ITS1, 5.8S rRNA, ITS2, and 28S rRNA, where ETS = extragenic transcribed spacer and ITS = intragenic transcribed spacer. Specific cleavage events followed by methylations generate the mature products. Also, some rRNA genes in some species have introns that must be spliced out. 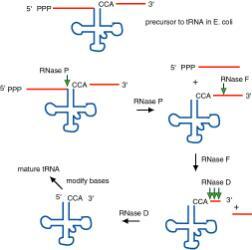 RNase P is an endonuclease that cleaves the precursor to generate the 5' end of the mature tRNA. RNase F is an endonuclease that cleaves the precursor 3 nucleotides past the 3' end of the mature tRNA. RNase D is an exonuclease that trims in a 3' to 5' direction to generate the 3' end or the mature tRNA. Figure 3.3.3. The ends of tRNA in E. coli are produced by the action of three nucleases that cleave the precursor to tRNA. A schematic of the pre-tRNA is shown at the top, with RNA extending from the 5’ and 3’ ends of the RNA that will become the mature tRNA (shown as a cloverleaf). 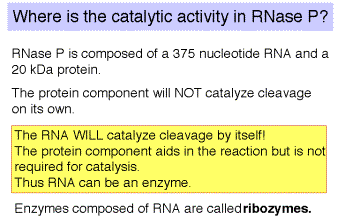 The site of cleavage is indicated by the short vertical arrows above the lines denoting RNA, and they are labeled with the name of the enzyme cutting at that site. The enzymes catalyzing each reaction are listed above or adjacent to the reaction arrows. RNAse P is composed of a 375 nt RNA and a 20 kDa protein. The catalytic activity is in the RNA. The protein is thought to aid in the reaction, but is not required for catalysis. All enzymes are not proteins! This was one of the first instances discovered of catalytic RNA, and Sidney Altman shared the Nobel Prize for this. The enzyme tRNA nucleotidyl transferaseadds CCA to the 3' ends of pre-tRNAs. Virtually all tRNAs end in CCA, forms the amino acceptor stem. For most prokaryotic tRNA genes, the CCA is encoded at the 3' end of the gene. No known eukaryotic tRNA gene encodes the CCA, but rather it is added posttranscriptionally by the enzyme tRNA nucleotidyl transferase. This enzyme is present in a wide variety of organisms, including bacteria, in the latter case presumably to add CCA to damaged tRNAs.